Such a long, long, blooming tough and dependable native this forgiving perennial outshines all other cultivars in the size of each flower. The many rows of glowing lavender petals that characterize this fabulous perennial outline nearly 2″ wide flowers. They begin in earnest in late May and proceed unabated until early autumn. If the flowers become tired or scorched simply cut it back and wham! You’re quickly back in business. Adaptable to many soil types and will subsist on only natural rainfall but occasional deep soaks in summer reaps rewards. To 10″ tall forming a round perennial to 18″ wide. Full sun, to very light shade. Pollinator masterpiece. Oregon native plant. Santa Barbara Daisy or Mexican Fleabane. You choose. Either way its a great long long blooming perennial that thrives in our climate with good drainage. 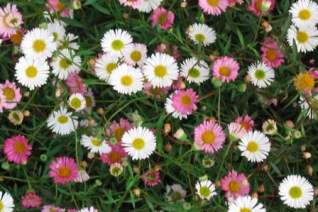 Masses of 3/4″ wide daisy flowers that open pink and then change to pure white. All the stages of color are present at once making it much more interesting. 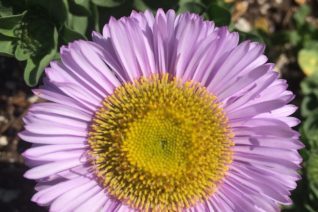 The fine, almost hazy texture that the daisies produce lightens borders, rock gardens and even containers. To 8″ tall x 2′ wide in a season. Rich, WELL DRAINED soil with light, regular summer irrigation. The more well drained the site the hardier to cold..thats why you often see it growing in walls or rock gardens. Its a fantastic long blooming carefree container plant as well. Completely winter deciduous. It also seeds around lightly. Very pretty, airy perennial native to Mexico. Full sun. 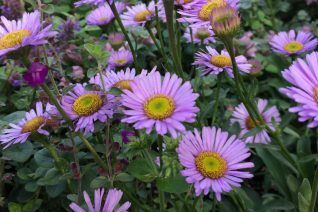 Possibly a hybrid this is a spectacular perennial in our climate where it produces a non-stop supply of amethyst blue daisies with a yellow center from spring unabated to autumn. And occasionally in winter. A rosette forming perennial that sends up its clumps of flowers on vertical 6″ spikes. Loved by all pollinators with a special emphasis given to butterfies. Carefree, low water western native perennial with consistent excellent performance. To 18″ wide in time. Light, consistent summer water encourages re-bloom. Nice little cut flower. Rich, to average, well drained soil in full sun. Avoid rambunctious competition from other perennials. Mix with Agapanthus, Calamintha ‘Montrose White’. Even effective in containers. Oregon native plant. Beach Flea Bane or more popularly Oregon Beach Daisy is a phenomenal native perennial for our climate. 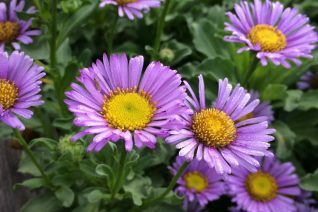 Low and spreading a continuous supply of periwinkle/violet daisies with a yellow center appear from late spring to autumn and occasionally in winter. To just 8″ tall it forms 2′ wide spreading clumps. Simple spoon shaped green leaves. In its native environs which is the cliffs immediately adjacent to the beach it can cling precariously which shows it has sturdy roots. Full sun to light shade and regular irrigation or absolutely none when established. This floriferous and larger flowering selection is from the southern oregon coast. Excellent performance in hells strips..at the front of borders. This excellent semi-evergreen native perennial should be everywhere. Oregon native plant.